It is just so darn sad about Finny. We are so sad too. Take care. Yes, sleep is a darn good idea. 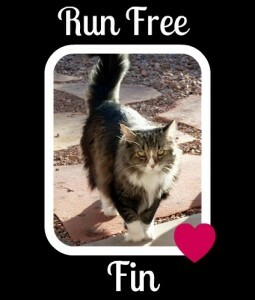 We are so sad about dear sweet Fin. Such a wonderful friend. We shall love her and remember her forever. You look so very comfy cozy there on your couch. Sweet dreams, my friend. YOu look adorable and kissable. I need to take a nap too! Sleeping is a good idea. And when weekend comes, let's sleep more! We are very sad to hear about Fin. We will be thinking about her and her family. Fin sounds like she was a wonderful cat. We'll wake you up when it's Friday. Good plan about going back to sleep! We're so sad about Finny, too. She was such a great friend, and we will never ever forget her. Such sad news about Fin!!! No point in waking up before Friday!!! We're off to bed too. So sorry about Fin. He was a great cat. We are so sad about Fin. Thank you so much for your lovely tribute to my girl. Your kind words are of comfort on Fin's passing. Thank you for your friendship.